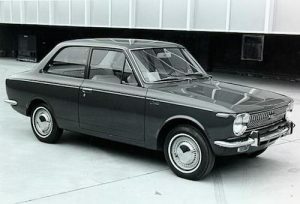 Over 43 million Toyota Corollas have been sold world-wide since this model was introduced in 1966. With long standing record sales, the Corolla is the best-selling name plate of all-time. This milestone anniversary will avail the 2017 Toyota Corolla with refreshed styling and enhanced safety features. Toyota will also be offering a new Corolla SE 50th Anniversary Special Edition model. The new 2017 Toyota Corolla will have a new sporty front grille and upgraded LED headlamps. New 16-inch wheels will be standard on the LE and XLE models while 17-inch alloy wheels will be found on the SE and XSE models. A new standard back-up camera will also be an added feature on all new Corolla models. New interior options for the 2017 Toyota Corolla will include elegant color schemes in shades of Almond/Gray or Black/Brown or sporty color sets such as Vivid Blue or Orange Zest. Upgraded premium fabric, redesigned climate control and circular air vents have all been designed to add an upscale look and feel. Technology upgrades on the new Corolla include standard Bluetooth and Entune Audio systems with Integrated Navigation and a 7-inch touch screen. A new standard Toyota Safety Sense-P (TSS-P) system will be found on all new 2017 Corolla models. This new suite of safety features includes Pre-Collision warning, Pedestrian Detection, Lane Departure Alert, Steering Assist, Dynamic Radar Cruise Control and Automatic High Beams. The 50th Anniversary Edition Corolla models will be offered with a choice of “Anniversary Edition” floor mats and exterior badging. These limited edition models will also be available with an exclusive new color option, Black Cherry Pearl. A new interior color theme of black mixed media seats with Black Cherry piping and contrast stitching will also be available. This new generation Corolla will be offered at a comparable price to the current year model with a base MSRP of $18,500 (L CVT Model). As one of the best selling vehicles for five decades in a row, we anticipate it will remain a Rochester Toyota customer favorite. The new 2017 Toyota Corolla will arrive in Rochester, New Hampshire soon. Please let us know if you would like to receive announcements on expected delivery dates.